The Bottom Line: This important, nail-biting crime thriller about MS-13 sets the bar very high. One of the year’s best thrillers. When Milwaukee Detective Jamie Graff’s phone rings, he can tell by the early hour that he’s about to receive bad news. His hunch is right, as he hears that yet another kid has been found dead from an overdose of heroin and fentanyl. The local drug trade, controlled by MS-13, has claimed the lives of three high schoolers and one middle-school student. They won’t be the last. Author Joseph Lewis has crafted an exceptionally timely crime novel about MS-13, aka Mara Salvatrucha, the international criminal gang that originated in Los Angeles in the 1980s. The White House has a stated goal of eradicating MS-13, and more recently, reports surfaced that MS-13 groups were encouraging its recruits, largely teenagers, to kill policemen. 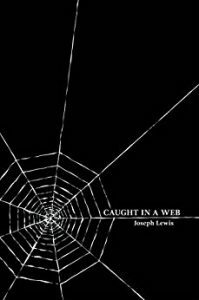 That threat is palpable in Caught in a Web, as Graff, effectively drawn as a world-weary local crime-fighter, is joined in his effort to dismantle the gang threat by intrepid undercover sheriff Detective Pat O’Connor and his control, Paul Eiselmann. Meanwhile, Ricardo Fuentes, an MS-13 member known as “The Blade,” is sent from Chicago to find out who is cutting in on their business. That’s only the beginning, however, as he is intent on finding and killing the 15-year-old that murdered his cousin. Using the incomprehensibly cruel and morally bankrupt Fuentes as a vehicle, Lewis holds little back as he demonstrates the extent of cultural decay at the hands of MS-13. The results are grisly – one scene with a 13-year-old is especially difficult to read – but extremely effective. Simultaneously, at Butler Middle School, Lewis creates a believable sense of how MS-13 threatens to destroy what is, in many ways, a normal educational existence. The result is a truly important novel in which readers will truly care about characters’ lives.